When we focus on our own shortcomings and limitations, our gaze waivers from God. Tuesday marks the official beginning of the Jubilee of Mercy. In order to be “merciful like the Father,” we must shed our preoccupations and self-pity (the “robe of mourning”) and instead allow ourselves to be clothed in the mercy that the Father offers. Immersed in this love, we have the capacity to imitate it to the best of our abilities. May the gesture of directing their thought and prayer to the Father each time they cross the threshold of their cell signify for them their passage through the Holy Door, because the mercy of God is able to transform hearts, and is also able to transform bars into an experience of freedom. I found this image of bars being transformed into an experience of freedom to be so powerful. For Pope Francis, these physical barriers cannot contain the love of God. I have the opportunity to open my heart to receive mercy each time I wake up and get out of bed in the morning, walk out the front door, or encounter a person with whom I have difficulty. 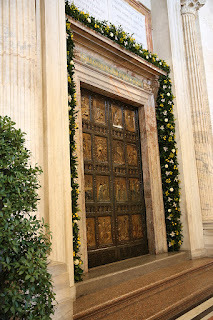 Whatever doors we pass through today, let us allow our hearts to be opened wider to God’s mercy. Third Friday of Advent: Righteous...or Right? Third Tuesday of Advent: Am I Listening?